Why do you hate cute redheads? It was my friend D’s birthday yesterday. However, the kite string that we originally intended to suspend the pi?ata with proved to be insufficiently strong and kept snapping under the weight of all the tasty candy…so we used a Cat5 ethernet cable instead. You know you’re in the presence of geeks when nobody found the utterance, “Crap! The string broke again! Does anyone have any ethernet cable?” unusual. I suppose that’s the case when a bunch of physicists, astronomers, and computer engineers get together. If you don’t care what’s illegal, you can do all kinds of things. -Fark user Son Of Thunder, when asked where kids acquire guns for their acts of crime. The FBI has released information about criminal uses of firearms in assaults on police officers. Most guns are stolen. None of the criminals in the sample group acquired their guns from gun shows. The availability of a gun was the primary factor, only one member of the sample group had a “weapon of choice”. The vast majority of guns found were handguns. Most criminals used “point shooting” techniques rather than using sights. Holsters were almost never used, with guns instead being stuck in waistbands. 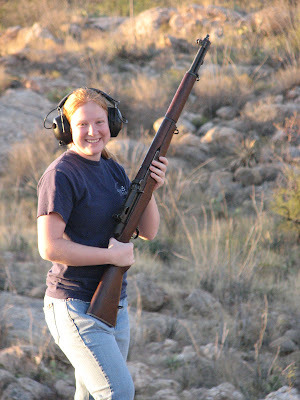 40% of the sample group had military firearm training. Many of them practiced frequently (though not at formal ranges). Blackwater Worldwide announced its support of AB2498, proposed legislation that would prevent prohibited persons from unlawful access to and possession of firearms. This legislation would serve to hold all responsible firearms training facilities to a common standard, allow training of responsible citizens, and, hopefully, reduce firearms capabilities of dangerous criminals. AB2498 basically requires any firearms training facility with a written contract with the federal government to provide training services to require background checks on those seeking training there, unless the individuals are members of the police or military. Somehow, I suspect that the criminals aren’t going to bother spending thousands of dollars at training facilities. Once again, a useless law that does nothing but inconvienience the law-abiding. Update: Sebastian pointed out that this law would only apply to facilities with written contracts with the federal government to provide training services. I’ve updated the original post with italicized text. The ATF issued a new ruling on 8/15/08 that clarifies various issues relating to what is or is not considered manufacturing a firearm. Evidently a gunsmith buying firearms, doing work to them, and then selling them counts as “manufacturing” and the gunsmith must be licensed as a manufacturer. A gunsmith receiving firearms from individual customers, performing work on the gun, and returning it back to the customer need only be licensed as a dealer or gunsmith, not a manufacturer. My Class III dealer friend is concerned that this might affect companies that do outsourced work like rebluing, hard chroming, etc. for gunsmiths (i.e. gunsmith receives gun from customer, sends gun off to be chromed, third-party company does the chroming, then sends it back to the gunsmith, who returns it to the customer). My reading of the ruling seems to indicate that this would not be a problem, as it’s not manufacturing a new gun. However, a gunsmith buying up guns on the open market (rather than doing contract work for customers), modifying them, and then reselling them on the open market would count as manufacturing a new firearm. I can sort of see how this would make sense. Why carry a gun at home?